This is my first book I borrow from Austin public library in Kindle version. I love the idea on being able to borrow books electronically but the availability of the books is pretty limited. I originally thought I don’t have to wait in line for a book anymore. It’s e-book for goodness sake. It’s not like I can hold the book physically. Boy, was I wrong. That’s my venting for the day. Back to the book review. To save the life of the boy she loves, Jacinda did the unthinkable: She betrayed the most closely-guarded secret of her kind. Now she must return to the protection of her pride knowing she might never see Will again—and worse, that because his mind has been shaded, Will’s memories of that fateful night and why she had to flee are gone. Back home, Jacinda is greeted with hostility and must work to prove her loyalty for both her sake and her family’s. Among the few who will even talk to her are Cassian, the pride’s heir apparent who has always wanted her, and her sister, Tamra, who has been forever changed by a twist of fate. Jacinda knows that she should forget Will and move on—that if he managed to remember and keep his promise to find her, it would only endanger them both. Yet she clings to the hope that someday they will be together again. When the chance arrives to follow her heart, will she risk everything for love? First of all, great job on the cover. 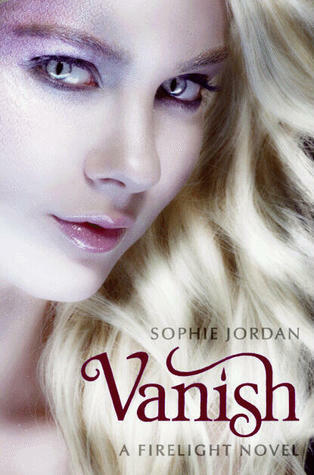 To me, Vanish is a fluff piece. I was doing stop-and-go reading for at least ten times and finally decided to finish the book because the book is due back to the library. LOL. The series can continue without this book. 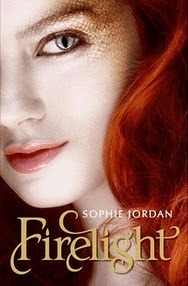 It did however answer one of my question from Firelight. How in the world can two person meet twice coincidentally? Will’s family moved to Chaparral because of the sighting of a draki (Jacinda’s mom, Zara) years ago. Zara wanted to relive old days and that’s the reason she moved Jacinda and Tamra there. Finally, Tamra manifested (or hit puberty). She is a shader, one of the unique form of draki, basically she can erase human’s memory. When they move back to the pride, Tamra thought Cassian would give her a chance now that she can manifest. Even though Tamra and Jacinda are twins, Cassian could not fall in love with Tamra not that he didn’t give it a try. Why do authors like to write love triangle keep going back and forth? It’s getting a bit old. Jacinda needs to make up her own damn mind. Although I am always team Will but I couldn’t not feel for Cassian for the way he scarifice for Jacinda. I don’t foresee any happily-ever-after ending for the three of them. I am still feeling neutral to either Team Will or Team Cassian. The story dragged for two-fifths of the book and finally Will showed up. Jacinda planned to run away with Will but was exposed by Miram. Both of them was caught by the hunters during Jacinda’s escape. Will caught up with the hunters and was able to rescue Jacinda during one of the driving break. Not much action there. The plot continues with Jacinda went back to the pride to tell them about Miram. Severin threatened to clip her wings and banished Zara. Cassian stepped in by promising to bond with Jacinda to avoid wing clipping. The book ended with the cliffhanger. Jacinda persuaded Tamra to leave with her to rescue Miram and reunite with their mother. Cassian joined in with the rescue because Miram is his sister. I am definitely not buying this book as part of my collection as I don’t believe I will do reread on it. I would however will read the next book “Hidden”. First, the cover is amazing and caught my attention immediately. This is my first dragon or draki (described in the book) related YA book. I was expecting a more paranormal experiences but the book somehow gave me more normal picture. The book started great with a girl, Jacinda, sneaked out as a rebellious act to get away from her life. Her being a fire-breather (none existed for several generations) is a rare breed and had an arranged marriage with Cassian. She soon found herself being hunted by some hunters and then “rescue” by a gorgeous boy, Will, when he misdirected the hunting group away from her. Because of her rebellious act, the pride planned to clip her wings. Her mom took Jacinda and her twin Tamra escaping the pride to desert town of Chaparral hoping the heat would kill Jacinda’s inner draki. Little did she know, she bumped into Will in the same high school her mom signed her up for. The hot and cold romance between Jacinda and Will began. Tamra character annoyed me throughout the book. The love triangle shaped clearer towards the end of the book. Team Cassian or Team Will? I didn’t get any strong emotional feeling towards either party. Jacinda later found out Will bled draki’s blood and she manifested into a draki form in front of Will’s cousin (who were draki hunters) in order to save Will. Cassian and Jacinda escaped to return to her pride with Will promised to find her wherever she is. I gave this book 3.5 star. As for the sequel, I might still buy it just to see how the story unfolds.